You are viewing the Screen Printed T-shirt bundles. 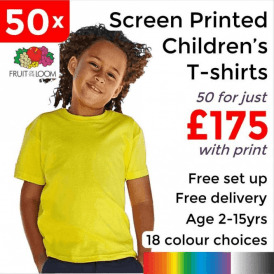 These products have been carefully selected from our full range of t-shirts because of their popularity, quality, price and diverse array of colours. All t-shirt bundles feature garments from the following brands. 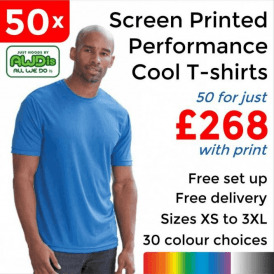 AWDis: The just cool range of t-shirts are produced from Neoteric™ moisture wicking fabric, this is made to draw sweat away from your body during physical activities to maintain your performance and comfort by keeping you cool and dry. 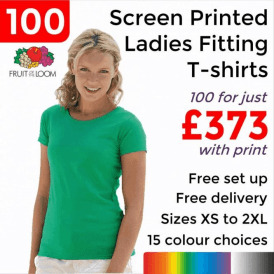 Fruit of the Loom: This long running brand manufacturers millions of t-shirts every year which are sold worldwide for all sorts of purposes. Their cotton tees are a massive favourite for band merchandise, promotional giveaway garments through to large sport events. For a basic printed tee you can't really go wrong. 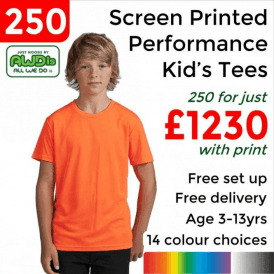 Gildan: Heavy cotton garments are their thing, the GD005 tee comes in a lot of colours and sizes but most importantly the stock holding in the UK is vast meaning they will always be available for those regular or urgent orders. Bundle quantity - the garment brand - the total price including your logo - the colour and size options you have to choose from. As well as that you will notice there are no hidden charges for set up or admin. 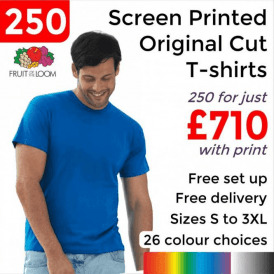 All T-shirt bundles include a 1 colour screen print, you can choose the position of your print from - Full Chest, Left Breast or Full Back. Once you have chosen you product colour and sizes you will be directed to the page where you upload your logo. Ideally we need an EPS file which is editable, a hi res Jpeg or PDF is also suitable so send what you have and if there's any problems we will contact you. In all instances you will recieve a visual by email showing your logo on the item so you can approve or amend your design before we go ahead. I want more than 1 print on each item! That's fine, simply choose the option when you add the first logo and it will calculate the extra cost. Most customers add a second position as our prices make it very affordable to do so! Filters on the left side of your page make browsing the T-shirt bundles really quick and easy. Every T-shirt bundle comes in 4 different quantity options, t-shirt bundle breaks include 50, 100, 250 & 500. T-shirt bundles include Unisex, Ladies, Men's and Children's specific items. Brand Identity is a trusted B2B supplier of promotional clothing and workwear. 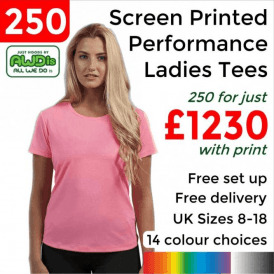 Over 100 bulk orders are dispatched every week from the Essex based Factory in Southend on Sea to happy customers in the UK and around the world. We’re committed to providing high-quality items at the lowest possible prices with industry leading fast 5 day turnaround. Only 5 working days for dispatch on all orders with print or embroidery! Want some free advice? Chat with an expert member of our team, just click on the chat button on the bottom right of your screen. If you prefer a phone conversation, give us a call 01702 410044 for some advice on your branding. Pop in and see us, address details are on the 'Visit our showroom' tab.